LQ Industrial 30 Pack Gold Round Phillips Head Button Stud Screws 6x8x8mm Chicago Screws Nail Rivet For DIY Leather Craft by LQ Industrial at The Artisan Lounge. MPN: unknown. Hurry! Limited time offer. Offer valid only while supplies last. Feature: Good toughness solid brass head, combined with high hardness iron bolt, make the screw be easier to install and fasten better. 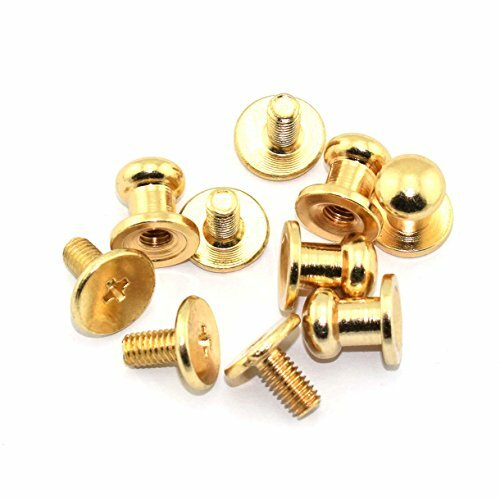 Good toughness solid brass head, combined with high hardness iron bolt, make the screw be easier to install and fasten better. High quality solid brass head button, wearproof and anti-rust, anti-oxidation treatment with nickel plating process, keeps the luster more lasting and bright as new. Nickel plated carbon bolt, anti-corrosion and anti-rust, bright luster combined with high hardness for easier operation and better fastening. Round Head Button Size: Top diameter 6mm (1/4"), bottom diameter 8mm (5/16"), length 8mm (5/16"). Applied to all kinds of leather craft DIY, such as belt, handbag, shoes, clothes, leather bracelet,you can use it as long as you want. View More In Leathercraft Rivets.